Never fear — PR is here! So it seems Pearson airport is firing its nurses — who handle 700+ patients per month, meeting them at or on the plane if necessary — and turning their jobs over to the Peel Fire Department and local ambulances (i.e., if there’s an emergency at the airport they’ll just call 911). How can anyone say that with a straight face? Perhaps Armstrong is a robot. Comments Off on Never fear — PR is here! 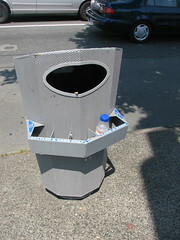 Vancouver’s garbage cans now have a little shelf on the front, in which you can leave return-for-deposit bottles (the vast majority of drink containers in BC are deposit-return). People used to just leave return-for-deposit bottles on the ground next to the garbage cans so other people could take them and return them — this is tidier. Also easier and less undignified for folks than digging through the bins. MONTREAL, April 1 /CNW Telbec/ – The departure today of Air Canada flight AC 830 marks the return of seasonal non-stop service between St. John’s, NL and London, U.K. until the end of October 2007. Air Canada’s service to London will operate three times weekly on Wednesday, Friday and Sunday in April 2007, increasing to five times a week in June 2007, and to daily service from July 1, 2007 through the end of September 2007. Air Canada flight AC830 will leave St. John’s at 12:55, arriving in London at 21:25, and flight AC831 will leave London at 22:40 arriving in St. John’s at 00:45. “Air Canada is a longtime partner of ours and a major service provider here at St. John’s International Airport. I’m very pleased to welcome their new seasonal service on the St. John’s to London route, a route they have served for so many years,” said Keith Collins, President and CEO, St. John’s International Airport Authority. The Newfoundland and federal governments are welcoming the resumption of year-round, direct air service to London by Astraeus, about six months after Air Canada cancelled the service. Beginning in May, the independent, British-based airline will provide three flights a week from the St. John’s airport to Gatwick, 45 kilometres south of London. Air Canada quashed daily service to London’s Heathrow airport in September, saying the route wasn’t profitable enough. It signalled the first time the province was without year-round transatlantic air service since the Second World War. Went to Vegas with my family and Randy for my mom’s 60th. They liked Cirque du Soleil and the short flight to the Grand Canyon was actually fun. The good news: complaints are down! – Some people suggest that a more efficient way to deal with the Panama bottleneck would be a new deep water port on the Pacific side and a rail link across the isthmus. This is a revival of a very old idea (there is already some kind of rail link, and I think there were old railroads before the canal, although not sure), but it has some intuitive sense again for a few reasons. Supertankers and big bulk carriers are already far too large for the canal, even post-expansion, so it’s really about container ships. And I think that the largest container ships are soon going to be too big for the post-expansion canal, if they aren’t already. The biggest out there is the Emma Maersk, at 11,000 TEU, and the estimate for post-expansion capacity is 12,000 TEU (although it’s really about exact dimensions, not estimates of numbers of containers). And of course the whole point of containers is that they can be easily inter-modaled, so the idea of loading onto separate ships on the Atlantic side seems to make sense. – There is also a lesser known “Suezmax” limit. Given the lack of locks, the practical limit is on draft, and there is apparently a canal-side pipeline so that fully loaded tankers can send part of their payload alongside to meet them at the other end. – Malaccamax is a naval architecture term for the largest ships capable of fitting through the Straits of Malacca. A Malaccamax ship is defined to be, with 18,000 TEUs, of 300,000 DWT, 470 m long, 60 m wide, 20 m of draft. The restriction is caused by the shallow point on the Strait, where minimum depth is 25 m.
A post malaccamax ship would need to circumnavigate Australia, use the Lombok Strait, or use the proposed yet-unbuilt Kra Canal. No such ship has yet been built. Had a great time in Chicago with M. and R. despite the decidedly wintery weather. J. intelligently brought her down-filled coat; I should have done the same. With due respect to Dalton48, 0 degrees with high winds is *not* the same as 0 degrees without. As reported by the weekend Globe & Mail. The 21 finalists make a fascinating and multicultural list; I wish I knew more about them. Website here. We all have personal favourites that did not make it. For me, it is the Pantheon and Chartres; maybe they are not big enough? None of the pictures seem to feature riders with Trail-a-bikes or baby seats, though. Can’t imagine why.